Some big results, fellow wafflers. Overeem win the battle of Tassie dominance, the two remaining Islay behemoths narrowly overcome their opponents and Highland Park knock out champion Tassie distillery Sullivans Cove, all by only a couple of percentage points. It was an unbelievably close round, with many results only decided by the final few votes. And now our quarter finals take shape. Bruichladdich have not had too much trouble dealing with opponents so far, but will Overeem prove a sterner test? Glen Moray, everyone’s favourite underdog have scraped through so far, but face Tasmanian independent title favourites Heartwood in the next round. 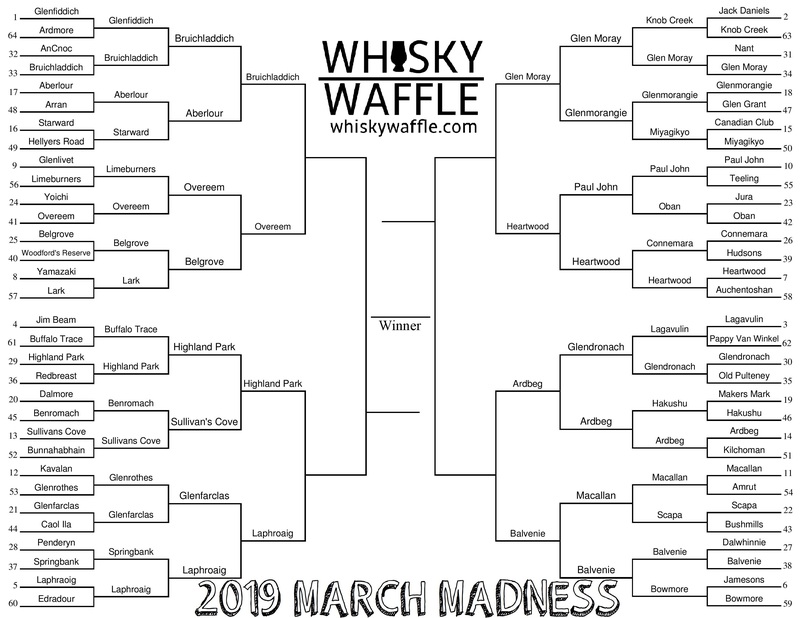 Elsewhere, Highland Park take on Laphroaig and two Whisky Waffle favourites in Ardbeg and Balvenie go head to head. Who will win? YOU DECIDE! It’s getting easier to vote these days – just send us four names via a comment, email or social media and we will add them to collection of votes! If you haven’t already, check out our podcast where we discuss the results up to round 3. Happy voting and keep on waffling! 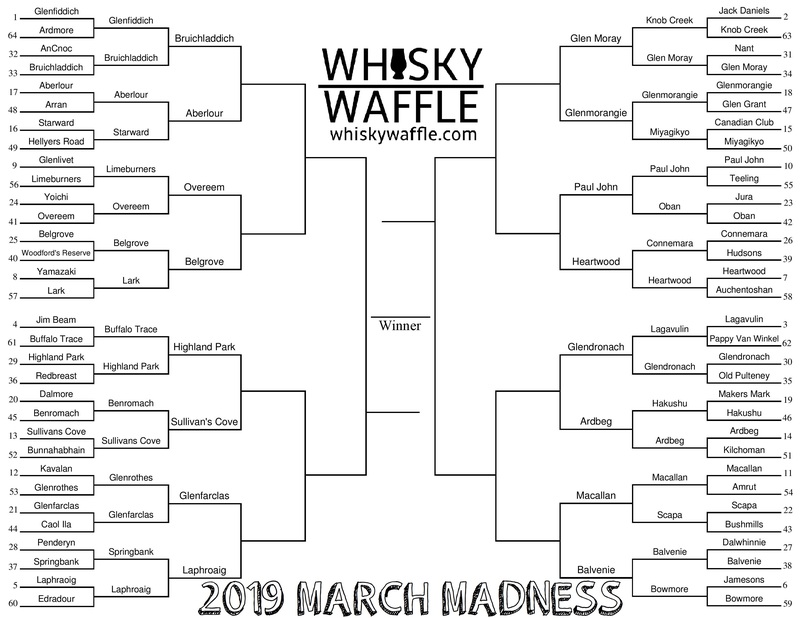 The suspiciously April-y March Madness Whisky Waffle bracket powers on into Round 3: the round of 16! Once again we’ve halved the field in a vicious round 2 which saw a number of shock results and big guns fall. Gone is Australian whisky’s founding member Lark, Australian whisky’s high-selling Starward and all remaining American and Irish representatives. Possibly the biggest shock of all is the defeat of number 3 seed Lagavulin, knocked out by the dark horse, Glendronach. We now move into the pointy-end of the competition and once again there are some juicy match ups. In another gut-wrenching all-Australian match up Overeem take on Belgrove, Macallan verse Balvenie in a battle for Speyside supremacy and the last remaining non-Australian or Scottish drop, Paul John, loses to takes on Heartwood. Perhaps the one that kills me the most, however, is my favourite Islay distillery fighting to the death against my favourite mainland distillery: Ardbeg vs Glendronach. Only one can progress to the quarter finals. Who will it be? Vote by whatever rules you feel you’d like to live by. Skip any you can’t decide upon and get us your thoughts throughout the week sometime! Good luck, and may the best dram win!